Add more length to the NES Classic Controller with Extend Link for NES Classic Edition. Extend Link is a 6' extension cable for the NES Classic Controller and is ideal for sitting back at a comfortable distance to enjoy some classic Nintendo video games without having to move the console out from an entertainment center. Extend Link extends the length of the NES Classic Controller by double its original length. Extend Link is also compatible with some Wii™ and Wii U™ wired controllers and SNES Classic Edition. 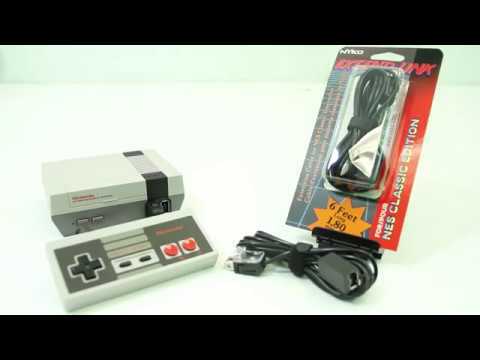 *Please note, in order to plug two Extend Links into the NES Classic Edition, the plastic clip needs to be removed from the piece that plugs into the console. Please see FAQ section below for details on removing the clip. 1. The plastic clip is preventing me from plugging in two Extend Links. How do I remove the clip? Step 2: Take off the plastic clip from the Extend Link. Step 3: Use the replacement screws attached to the instruction manual to fasten the connector piece back together. Step 4: Plug the Extend Link into the NES Classic Edition. For a video walkthrough on how to remove the clip, please see the video in the product image section above. 2. I have lost the replacement screw found in the instruction manual. How can I get replacements? Our support team can provide replacements. Please contact our support team HERE.